You haven’t lost your smile at all – it’s right under your nose. You just forgot it was there. Prosthodontics is a specialized field of dentistry that deals with the replacement of lost or damaged teeth. Procedures can be as simple as replacing a single tooth to as complicated as replacing every tooth in the mouth. This level of care is often required for dental trauma, birth defects, oral cancer, complications from prior procedures, and more. 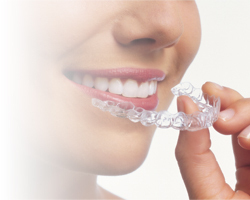 Our Prosthodontic experts use thebest and latest technology available to make sure that your smile’s reconstruction goes smoothly and looks completely natural. Crown placement is one of the least intensive prosthodontic procedures and can be completed in as little as two visits. The crowns themselves are tooth shaped coverings that are placed over top of an existing tooth and used to restore it’s original look and function. Discolored, broken, worn down, or misshapen teeth can all benefit from a crown placement. Crowns are made of either porcelain, metal, or a combination of the two. Metal crowns are the most durable but do not blend in cosmetically with other teeth. Because of this, metal crowns are usually recommended for molars. Porcelain crows are much more aesthetically pleasing and are virtually indistinguishable from natural teeth. However, porcelain crowns are also more prone to wear and require more daily care and professional upkeep. All permanent crowns are specially made in a lab to fit the tooth, but a temporary crown can be worn until the permanent one has been fashioned. Bridges are rows of crowns and/or prosthetic teeth that fill in the gaps left when other teeth are lost. They are anchored by existing teeth, dental implants, or occasionally both. Remaining teeth may loosen and shift in response to the gap created by a missing tooth, but bridges help prevent further tooth loss and other dental issues. Like crowns, bridges are custom made to perfectly fit each individual patient but temporary bridge are available for short term use. Bridges are durable but do require special care. Our prosthodontists will work with you to create a hygiene plan which will keep your bridges beautiful for years to come. Veneers are ultra-thin tooth colored shells that are bonded to the front of the teeth to improve their appearance. When the face of a patient’s tooth is worn down, the veneer is affixed with a special cementing agent. Veneers can improve teeth which are discolored, chipped, misshapen, or those which have small naturally occurring gaps between them. Veneers are made from either resin or porcelain. Porcelain veneers can be more expensive but are more durable and more closely resemble the natural look of teeth. Resin veneers are not as aesthetically convincing or durable but are more affordable and do not require as much of the natural tooth to be worn down before application. Veneers can last between five and ten years with proper care before needing to be replaced. Inlays and onlays are pieces made from porcelain which are used to replace parts of a missing tooth. Inlays are smaller and are usually surrounded by natural tooth while overlay provide more extensive coverage. Many patients choose to have existing metal fillings replaced with porcelain alternatives because they are more natural looking and increase the strength of the tooth more efficiently. Because they cover only the affected area of the tooth, inlays and onlays are less expensive than a crown and a great option for those that have cavities but do not want to remove the tooth in order to fit a crown. In order to create an inlay or onlay, one of our dental specialists will cast the patient’s tooth to create the custom piece. For those looking to improve their smile without the hassle and costs of implants or tooth shaping, dentures may be the perfect solution. Dentures can either be full, meaning that they replace every tooth in the mouth, or partial, meaning that they replace only one or a few teeth. Full dentures cover the roof of the mouth and are held in place solely with a temporary adhesive while partial dentures sit on a metal framework that holds the appliance in place. Partial dentures may need the help of a crown to stay anchored securely. Dentures are known to be slightly uncomfortable or awkward in the first few weeks of wear, but your mouth and facial muscles should quickly adjust to accommodate the new appliance. If problems persist, our skilled prosthodontists will work with you to make your denture wearing experience as comfortable as possible! Located in Coral Springs – Stop by our offices today!